Get your nose out of that module! 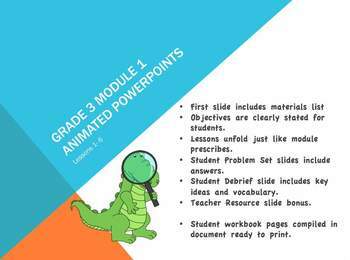 This PowerPoint Bundle will help you teach Topics A, B, and C (lessons 1-10) of Module 1 from EngageNY. I am creating them for my third grade team because technology integrated lessons make a huge difference in holding our students’ attention. 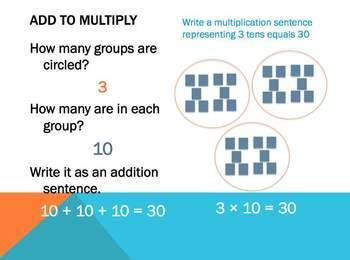 These lessons mirror the module exactly and allow you to interact with your students. They have the answers to the sprints and problem set questions so you can have students discuss their mistakes for immediate feedback. I do not have the answers for homework or exit ticket included so you can use student examples and write them on the smart board. You can edit the slides and customize them if you want as well. These are a teacher’s timesaver! 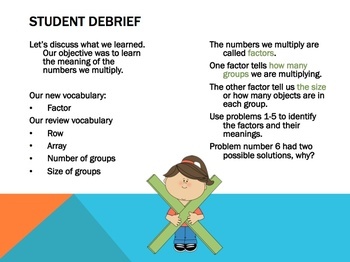 I also included a materials list on the cover slide for each lesson to help keep you organized and as a bonus included a resource list slide that includes online videos, worksheets and center ideas on the lesson skill. You will love it! 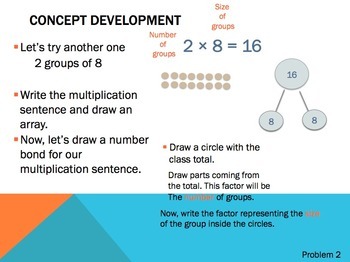 Preview Lesson 2 & 9 for free as an example of the format for each lesson. Included STUDENT WORKBOOK for ENTIRE MODULE 1. These student pages will save you time flipping through the module to find what to copy. You can download the Engage NY module 1 pdf directly from their website. I also have module 3 and 4 uploaded. Module 2 is almost complete.